This trip was during August 2011. I was headed to Florida from New Jersey but had a connecting flight. I chose my connection location carefully. (Continue reading and you’ll see why.) I arrived at Newark EWR without incident and went through security. Of course my Jersey girl costume jewelry went off in the metal detectors and I received a friendly pat-down. After making a couple phone calls I boarded the plane. I chatted with a gentleman in my row. We talked about him living in Florida and me going to visit family there. He asked where I lived and we talked about Paris. He told me he hadn’t been there in almost 30 years. We had a few laughs at the expense of the cigarette smoking, skinny, wine drinking, French. A young lady then sat between us. We talked about her life. She shared that she will be a freshman this fall in college majoring in Art. She worked on a little drawing during the flight that was very good. The drawing was a girl character of some sort and she was putting wings on it. Once in air all I could think about was my layover in Charlotte. Truth be told I thought about it when I knew I had to book my flight. I was excited to stop there to get some food. I love CLT airport. There are cute little shops that cater to your every need and whim. I remember about 3 years ago a coworker and I had a layover there on the way back to New Jersey. We decided to have a drink in Tequilaria. The name alone sounded exotic and wonderful! The drinks were pretty good too. We sat at the bar and chatted with the bartender until our delayed flight was finally ready for boarding. During my most recent layover there, 1 month ago, I was looking for food. Burgers did not interest me and I settled on Chinese food. I looked for it on the giant directory. While walking towards the Chinese food, I noticed a long line. It wasn’t for the Chinese, it was right next to it. 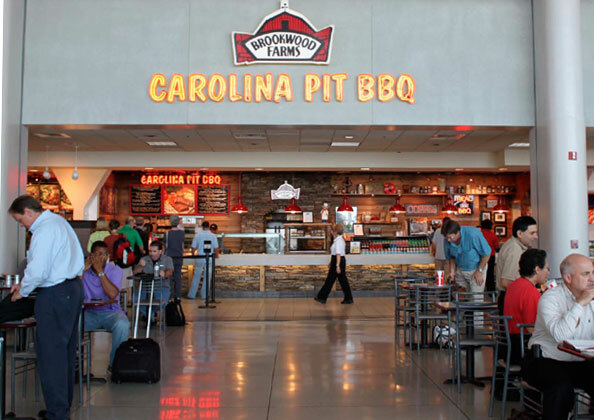 I looked up to see that it was North Carolina BBQ. With the line being so long I figured it had to be good. I glanced at the food behind the glass before getting in line. I saw a giant piece of meat that was being sliced. I had made up my mind after reading the menu. It was a tough choice between the ribs or the pulled pork but I opted for the pulled pork sandwhich with fried okra. I was so excited. I love Carolina BBQ! The staff was very friendly. The food looked good but I hoped the meat wasn’t too dry. I asked them not to put bbq sauce on the sandwich (since I don’t eat it). The man at the end of the line reached in a food bin and put something on my plate. It was fried and in the shape of a wedge. I paid for my food and happily sat down. The pulled pork was the best pulled pork sandwich I had ever had! It was soft and it seemed to have melted in my mouth. The fried wedge that I thought was a potato turned out to be a fried pickle! Even that was yummy too. I was a greedy person in heaven. I had bliss on my face as I held the sandwich with two hands and ate it. I had told the man in my row about this experience and he said he may join me for a bite there before his next flight. We got off the plane and shared a delicious meal at Brookwood Farms. After finishing the meals, we exchanged names and wished each other good luck in travel and life. Please stop at this place if you have a chance!! You will love it! I hardly leave responses, however i did a few searching and wound up here Grab a BBQ Bite in Charlotte (CLT) Travelingmad's Blog. And I do have a few questions for you if you do not mind. Is it just me or does it appear like some of these comments appear as if they are coming from brain dead people? 😛 And, if you are posting at additional places, I’d like to follow anything fresh you have to post. Could you make a list of all of your social pages like your twitter feed, Facebook page or linkedin profile?